One pan Lemon Garlic Butter Chicken is moist and full of flavor! You can have this wonderful chicken dish on your table in less than 30 minutes! Let me just tell you that this is such a delicious chicken recipe. The flavors are incredible and you probably have most of the ingredients in your kitchen. It’s a great one pan chicken dish that you will want to make again. My family loved it so much that they were going back for seconds! I used the skin on and bone in chicken, but you can use the skinless, boneless chicken thighs. The time to cook will be a little less than indicated here. Serve with your favorite rice and salad and you have a fantastic meal! Yummy summer flavors! 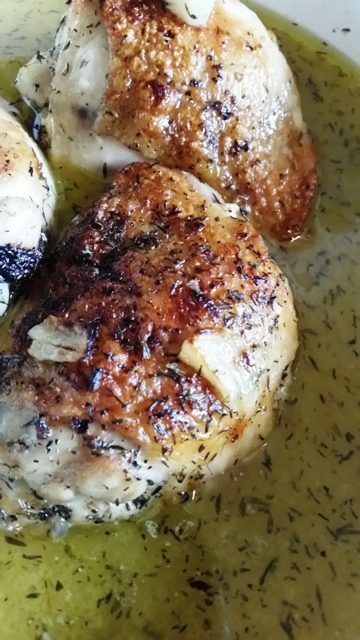 Lemon Garlic Butter Chicken is a fantastic one pan chicken dish. Full of fresh flavors of lemon and garlic! It will be your newest favorite chicken dish. Have this on the table in under 30 minutes! Heat olive oil in large non-stick frying pan over medium/high. Sprinkle salt and pepper all over chicken thighs. Add ½ cup chicken broth and scrape bottom of the pan to deglaze. Return chicken to pan and add the remaining ½ cup chicken broth. Cover and simmer for 15-20 minutes. Baste chicken with liquid. Remove lid. Add lemon juice and thyme and capers. Nettie, we eat a lot of chicken, but we’re in a rut, making the same things over and over. So, I’m thankful for these recipes that you’re sharing. This is another that looks good and super-easy to make. Do the capers give it a necessary taste or can I leave them out? Also, do you have the perfect rice recipe to go with it ? Thanks so much! I love lemon garlic anything! This sounds and looks sooooo good! 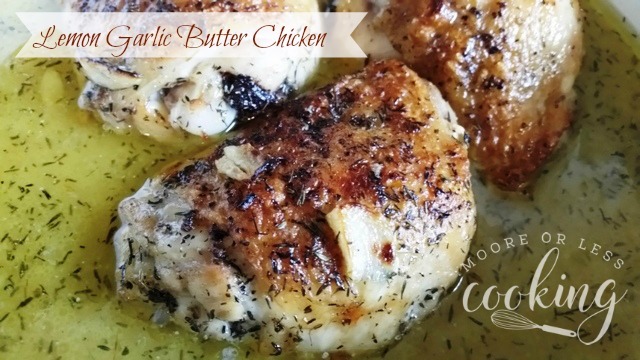 To see that chicken swimming in that butter… Wow!